First published in 1989 to meet the needs of the growing fashion knitting community, Vogue Knitting: The Ultimate Knitting Book instantly became a trusted and beloved resource for knitters. The second edition, released in 2002, only further cemented its place as the most trusted knitting resource. To date, more than 1 million copies across both editions have been sold. The past fifteen years have seen many exciting advances in knitting, and it is once again time for an update. The library of cast-ons, increases, decreases, and bind-offs has been expanded with new essentials. Brioche, entrelac, double knitting, and mosaic knitting—former trends that are now favorite techniques—each have an in-depth section. The design and construction chapters, formerly only covering sweaters, now also includes dozens of options for hats, mittens, socks, gloves, and more than 25 shawl shapes. New comprehensive chapters on lace and cabling incorporate everything a knitter could possibly need to know when increasing, decreasing, reading charts, working borders, and much more. Information about knitters' tools, correcting errors, finishing, embellishing, and garment care have all been expanded to provide a masterly understanding of every stage of knitting. 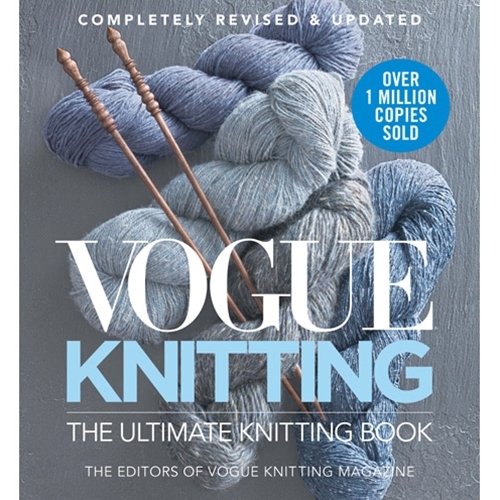 With updated, revised, and new material throughout, more than 70 additional pages, and more than 1,600 photos and hand-drawn step-by-step illustrations, Vogue Knitting: The Ultimate Knitting Book, Completely Revised and Updated is surprisingly easy to navigate with thorough indexing and footnote cross-referencing. From beginners needing to learn the very basics to seasoned knitters needing a refresher on a complex technique, this is a guide that every knitter will cherish for years and years to come.